A small sound replacer that modifies multiple shouts to fit a crusader roleplay/cosplay. All sounds credited to Starbot Dubs. If you'd like to change anything of the mod, go ahead. Have you ever wanted to play as a crusader in Skyrim? Ever felt like shouting down the heretic Thalmor in true crusader style? Ever feel like crying aloud from the rooftop "MEMES!" While there are multiple crusader weapon/armor mods, I found it strange that there were almost no shout mods relating to the legendary DEUS VULT. So I decided to put my hand in the ring and end this horrific dilemma! NOTE: This is a beta version. Only human males are currently effected (maleeventoned). Other races will be added eventually. It's been a long time since I started this mod and I finally plan on completing it. I will be making an SE version with a packed BSA when all the planned shouts are implemented. Until then, this version will work since the files are loose. Whirlwind Sprint - Ave Maria! Marked for Death - It says you're a heretic! 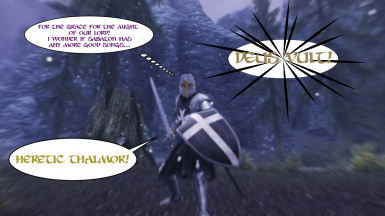 Call of Valor - Why aren't you on a holy crusade?! Call Dragon - Call the pope! Dismay - We will take Jerusalem! Dragon Aspect - Totally not gay! Clear Skies - Non Noobus Domine! Compatibility - This mod will work with any other mod, but will be overwritten by anything that alters shouts for human male players. Install this later in your load order. This mod contains no scripts, so it's completely safe to install and uninstall at any time. All credit to the voice goes to Starbot Dubs on Youtube. Not a single sound file is mine. This is my first ever mod I've uploaded (I did a Mario Star spell once, but I didn't finish it).